SANAA, Yemen -- Yemen's Shiite rebels and their allies made major advances Wednesday in the southern city of Aden, capturing parts of an upscale neighborhood in fierce combat and seizing men they accused of fighting them. The gains extended rebel control over the port city, Yemen's second largest, casting doubt over the effectiveness of a monthlong Saudi-led air campaign intended to drive them out from there and other areas they hold, including the capital, Sanaa. Security officials said the Houthi rebels, aided by military forces loyal to former President Ali Abdullah Saleh, had moved up the seaside road in the neighborhood of Khormaksar, taking an area stretching from the Russian Consulate to the Crater business district. Thousands of civilians fled the fighting as the rebels and their allies searched house by house for suspected adversaries. Eyewitnesses, including activist Maha al-Sayyed, said they pulled some of the men onto the streets and shot them, while warning residents over loudspeakers against harboring fighters. The rebel forces fended off counter attacks in Khormaksar, where they largely control the airport, as well al-Mualla district, using heavy weapons including artillery, tanks, mortars and heavy machine guns, the officials said. Witnesses said a large shopping mall in Khormaksar caught fire. Since March 26, a U.S.-backed alliance of Saudi Arabia and Arab countries has been carrying out airstrikes against the Houthis and Saleh's forces, trying to stop their advance after they captured Sanaa and much of the country's north last year. The Saudi- and Western-backed president, Abed Rabbo Mansour Hadi, was forced into exile. So far, the air campaign has been unable to halt the Iranian-allied rebels. 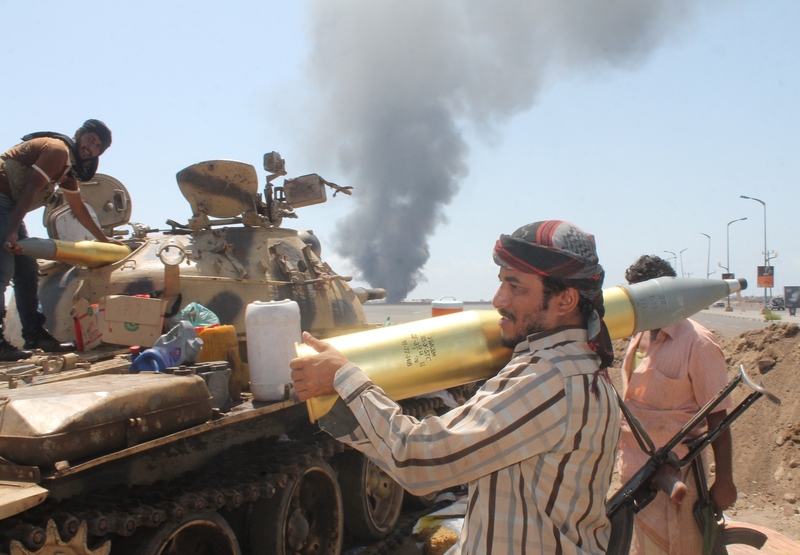 Aden has seen fierce fighting for weeks, as the rebels try to wrest the city from local militias and Hadi loyalists. The Houthis have imposed a siege on the city, cutting off fuel supplies and leaving large parts of it without power. Aden health official Khadr al-Soor told The Associated Press on Wednesday that fighting there had killed at least 375 civilians and wounded some 2,500, mostly civilians, since the air campaign began. The exiled government on Monday put the civilian death toll for the past month at 1,000 - nearly double the number that U.N. agencies previously announced. Airstrikes continued throughout the country on Wednesday, hitting targets in Aden, Saada, Hajja, Taiz, Ibb and Bayda. Street battles in Taiz also killed several people. The runway to Sanaa's airport was largely destroyed a day earlier. The fighting in Yemen drags on despite all sides having expressed willingness to enter peace talks. The new U.N. envoy for Yemen was expected to arrive in New York on Wednesday to consult with the parties there, followed by consultations with regional capitals, said Farhan Haq, the deputy spokesman for U.N. Secretary-General Ban Ki-moon. He is "going to get the parties together as soon as possible" and Geneva is one of the venues considered, Haq told journalists. Haq added that aid agencies are warning that humanitarian operations will cease unless the supply of fuel is restored. Shortages have pushed the country's health, water and sanitation systems toward imminent collapse, he said. Internet access, mobile phone service and landlines also could shut down within a week as well, he warned.